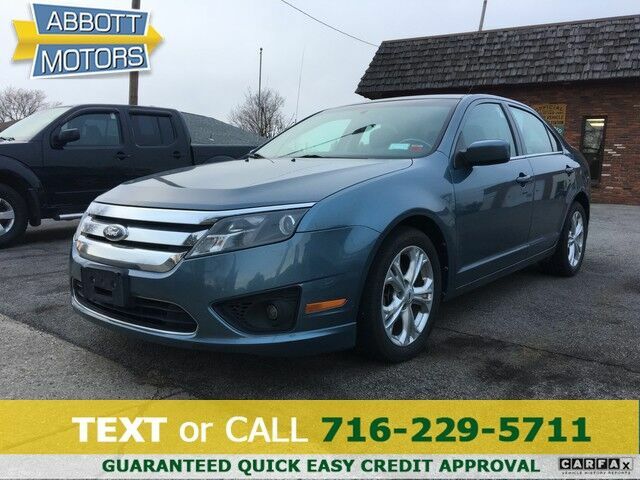 ABBOTT MOTORS, An exceptional car buying Experience, is offering this exceptional Kona Blu Metallic 2012 Ford Fusion SE Sedan w/Clean Carfax for sale. CALL or TEXT (716) 229-5711 for quick answers to your questions about this vehicle. Your message will be answered by a real human never an automation. We stock only the highest quality vehicles which have undergone a full safety inspection, fresh oil change, professional detail and Carfax Guarantee. All vehicles come with a Written Warranty and Extended Warranties are also available. CARFAX BuyBack Guarantee is reassurance that any major issues with this vehicle will show on CARFAX report. The less money you spend at the pump, the more money you'll have to spend on you. So why not consider this wonderfully styled, fuel-efficient Ford Fusion. Looking for a Ford Fusion that is in great condition inside and out? Take a look at this beauty. This Sporty Ford Fusion SE Sedan comes standard with features that are essential in the 21st Century. However, Ford decided to take it one step further and add a handful of quintessential options that will undoubtedly add to this vehicle's quality and value. With high quality all-season tires, this vehicle is ready for miles and miles of driving. This vehicle has been well-cared for inside and out. The paint is flawless with no damage or obvious signs of wear. We are proud to offer this 2012 Ford that truly a "must-have." This vehicle's wheels are one of the many attractive features that this Fusion SE Sedan w/Clean Carfax has to offer. More information about the 2012 Ford Fusion: Ford's Fusion offers a lot of bang for the buck in a mid-size car, and with a wide variety of engine options, available all-wheel drive, a Sport version, and a new hybrid system, it's a strong contender in a field that includes the Chevy Malibu, Honda Accord and Toyota Camry. Interesting features of this model are available hybrid powertrain, optional all-wheel drive, edgy styling, Excellent value, and selection of powerful engines ABBOTT MOTORS has over 50 years of automotive experience! We are also a CARFAX Advantage Dealer specializing in outstanding customer service and satisfaction! We offer FINANCING FOR EVERYONE...ALL CREDIT APPS ACCEPTED. We look forward to helping you purchase your next vehicle. Apply Online 24/7 at Abbottmotors.com ... All Trade-ins Welcome... Same Day Delivery... Call or Text Today and See The Difference... We Look Forward to Serving You!! This vehicle may be subject to potential open recall(s). Vehicle recall information may be found at Safecar.gov. Please verify price, equipment, options and features with your sales rep before your purchase. We Look Forward to Serving You. *Tax, title, plates extra. All Financing On Approved Credit. We are a BBB accredited member.